For a place we knew not where. And we prayed for the things to be. My God, those boys died rough. And some of the boys wore a grin. And onward to finish the foe. It made them hard to see. Our bombs could not reveal. 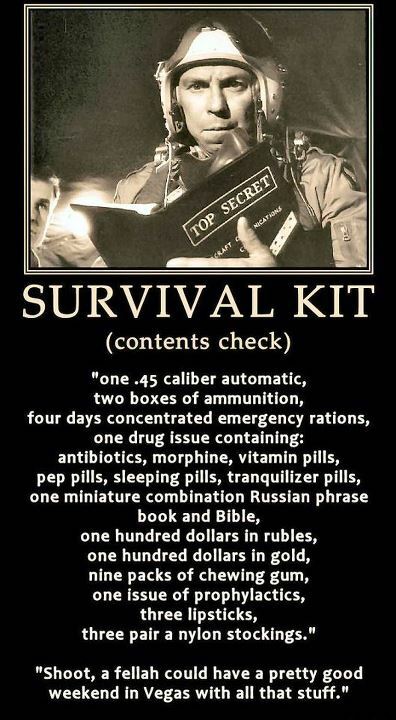 For those stubborn Japs within. That the Marines, too, could fight. But they soon found out that U.S.M.C. Was built of the rugged and rough. To set up another V.
And slept in that living Hell. Again our Air Force thundered. Well done, what a service rendered! Their victory will be remembered. And they were the last to move out. Claude William Hepp enlisted in the Navy Seabees (Naval Construction Battalion) Jan 13, 1943. He was a carpenter’s mate, third class and his unit was assigned to the 18th Marine Combat Engineers, Second Marine Division sent to the South Pacific. He wrote this poem after participating in the battle at Tarawa. 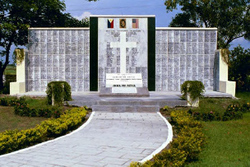 Claude died during the bloody invasion of Saipan and was buried at sea two days after his 22nd birthday. Acquired at the US Military Forum. Len Bryan – Tucson, AZ; US Navy, WWII, Korea, Vietnam, Cmdr. (Tribune News Service) — John Murphy was shocked by his first glimpse of MacDill Field. It was in late 1940, about four months before MacDill, formally known as Southeast Airbase, officially was activated on April 16, 1941. It was named in honor of Col. Leslie MacDill, a World War I veteran and aviation pioneer who died in a plane crash. Murphy, now 95 and living in Biloxi, Mississippi, was among the first to arrive at the base as it was carved from the scrub in the days before the U.S. entered World War II. 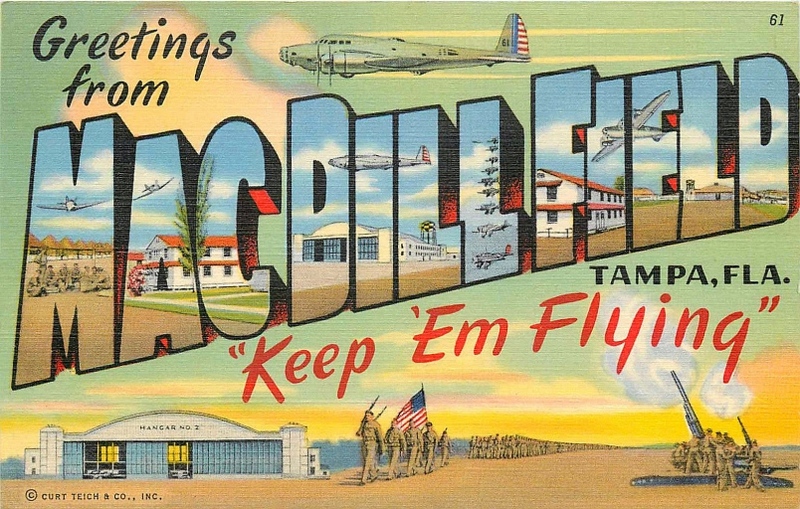 Today, MacDill Air Force Base is celebrating its 75th anniversary. 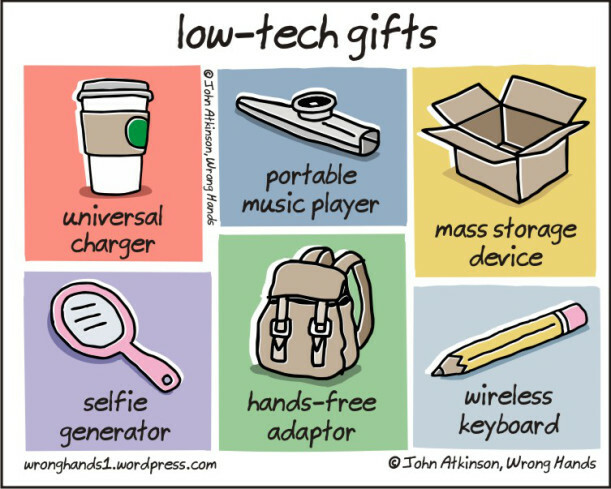 A lot has changed over the years. MacDill went from training crews to fly B-17 Flying Fortress and B-26 Marauder bombers to B-29 Superfortresses, B-47 Stratojets and F-84, F-4 and F-16 fighters. It now is home to two wings that fly KC-135 Stratotanker aerial refueling jets. The base has played a key role in U.S. military actions from World War II, the Korean War, the Cuban missile crisis, the Vietnam War, the Gulf War and the ongoing fight against jihadis in the Middle East and elsewhere. 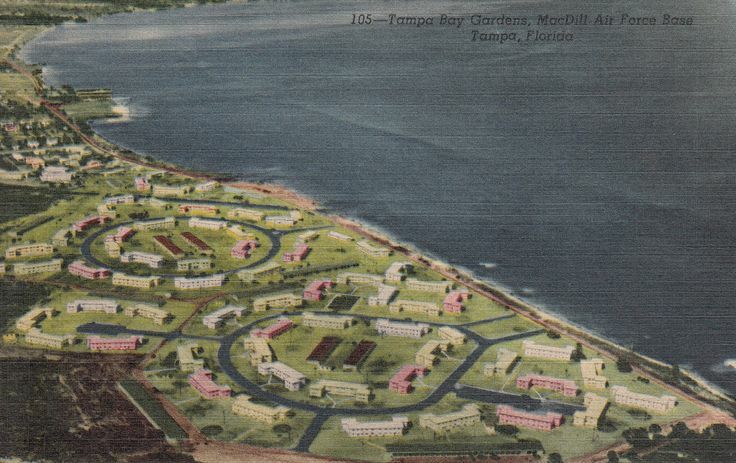 In 1961, MacDill became home of U.S. Strike Command, which became U.S. Readiness Command and later, in 1987, U.S. Special Operations Command. Socom provides trained and equipped commandos and synchronizes the global war on terrorism. 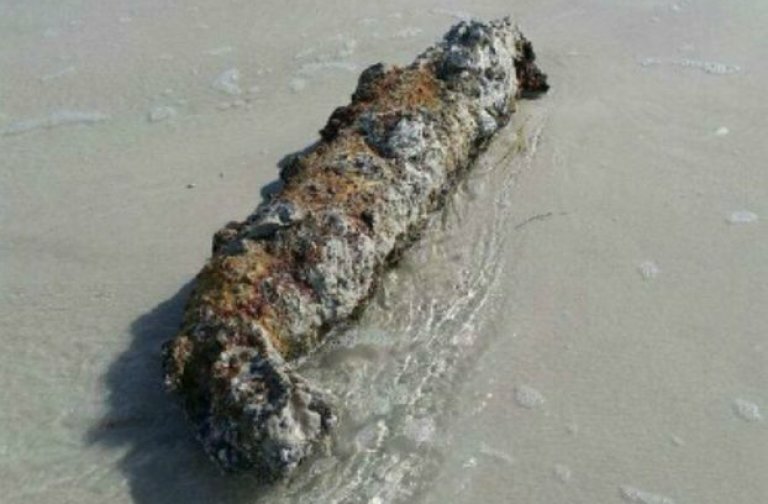 ST. PETERSBURG (Tribune News Service) — A World War II era bomb that washed up on St. Pete Beach over the weekend could have been lurking beneath shallow coastal sand for years, a local military expert said. At about 8:30 a.m. Sunday, a 4-foot cylinder M122 Photoflash Bomb, which appeared to have been submerged for some time, was found on the beach near the 22nd Avenue access point. 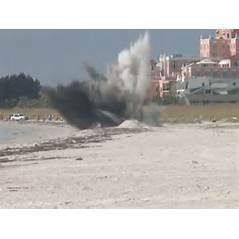 The beach and 20 nearby homes were evacuated as Pinellas County deputies worked with a MacDill Explosive Ordnance Disposal Team to destroy the device. Frank Correa, the historian for Largo’s Armed Forces History Museum, said finds like this are to be expected given the Tampa Bay region’s history with the war. Combat pilots trained at Drew Army Airfield, known today as Tampa International Airport, and MacDill Air Force Base, conducting training missions over the Gulf of Mexico. Florida was home to several training sites during the war, in fact, and Correa said the photoflash bomb was likely dropped over the gulf and during the seven decades since then made its way inland. “There’s no telling, that piece might have been here in the beach here for years,” he said. A lot of duds were dropped, likely without the pilots even realizing it, Correa said. 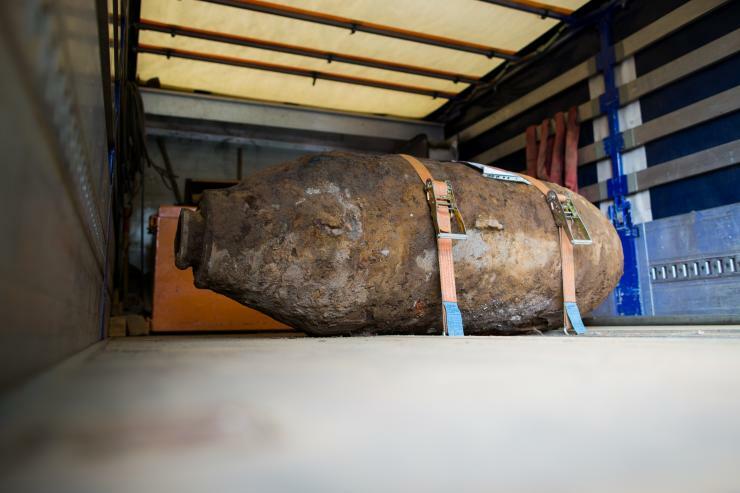 Hurricanes and other storms could have carried the unexploded bombs closer to shore over the years. “Back then they didn’t recover any of that stuff,” he said. 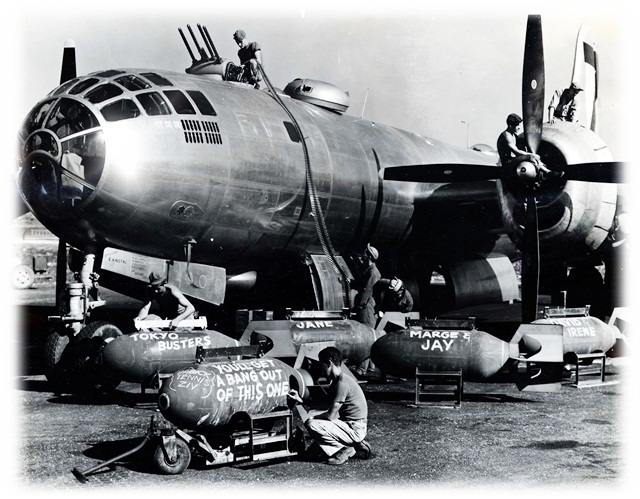 Military aircraft came to MacDill in 1940 and pilots began dropping dummy bombs filled with sand for target practice, said Denny Cole, a history buff and a retired Air Force master sergeant. Soon afterward, though, they began using lethal weapons for practice in areas including today’s Fort DeSoto Park. The photoflash bomb is just the latest aging explosive to turn up on Pinellas County shores recently. In October, an inert grenade was found by a man walking with a metal detector about 20 feet from the shore near the Sirata Beach Resort, 5300 Gulf Blvd. Handling these explosives requires a joint effort among local law enforcement agencies, Pinellas County Sheriff’s Office spokeswoman Cecilia Barreda said. The Sheriff’s Office received the initial call Sunday and contacted the Hillsborough Sheriff’s Office for help from its bomb squad. A berm was fashioned to protect the closest of three nearby sea turtle nests. Barreda said the sheriff’s office gets calls from time to time about old military ordnance kept as souvenirs that turns up in basements, attics and garages. “If there’s any question about what the nature of the device might be, the recommendation is to contact law enforcement,” Barreda said. Edward Martini – Pompano, FL; US Army Air Corps, WWII, PTO, 188th/11th Airborne Div. 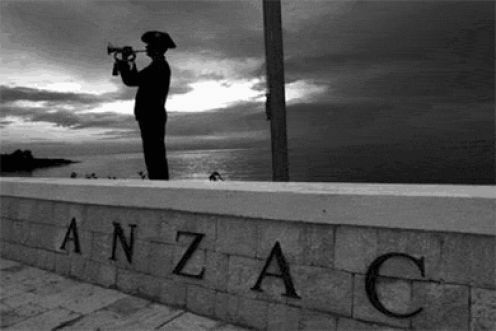 In honor of the Australian and New Zealand soldiers who have fought in numerous wars for their freedoms and the rights of others; 25 April is the designated date for memorial ceremonies and tributes. Age will not weary them, nor the years condemn. 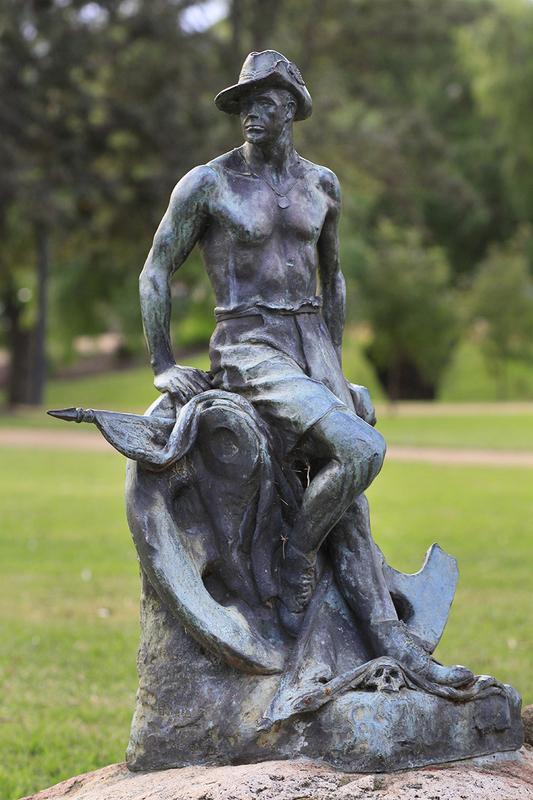 If you have the time – Please visit my past post for the Anzac Centenary and others. 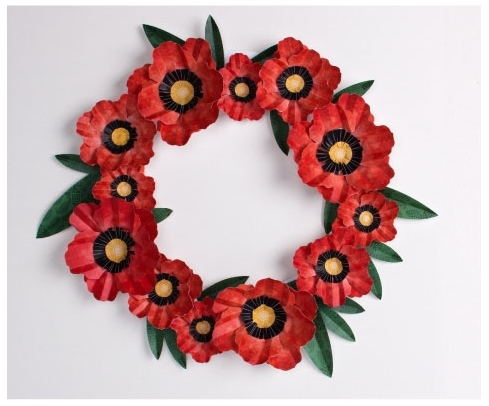 Besides these, you could add ANZAC DAY to your Tags on your Reader pages to honor these troops. 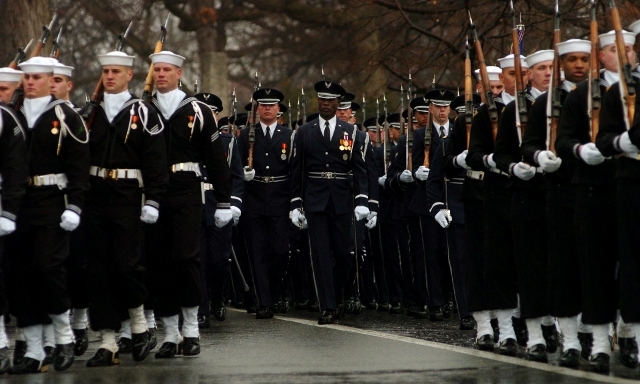 U.S Forces Honor Guard to honor all those that served for our freedoms in every war. Marquerite Schouten – Wairarapa, NZ; British Army # W/315535, Cpl. A great post – even the comments are a must-read for information! Can you imagine what it must be like to be marched out to face a firing squad, say goodbye to your closest friend who is standing next to you and then have the squad shoulder their rifles and march away having not fired a shot? What are the odds on that happening during a war situation? The mind boggles at the odds of this happening but this did happen to Charles Rodaway who served in the Loyal North Lancashire Regiment during World War II. He joined the Loyal North Lancashire Regiment and was posted to Shanghai in 1934. He undertook guard duties in Shanghai before being transferred to Singapore in 1938. At the fall of Singapore in 1942, he was captured by the Japanese and put to work as a labourer in the Kawasaki shipyards, near Tokyo. In 1944, he and a friend attempted to escape but were captured and sentenced to death by firing squad for the escape attempt. In an interview, he said, “I said to my pal, ‘This is it’. 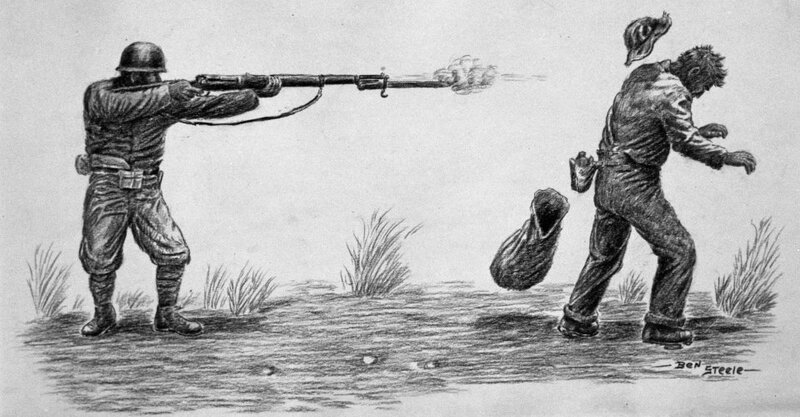 Instead of a volley of bullets, the officer in charge, ordered the firing squad to shoulder arms and marched them away. Charles was released from the prison, a week after the Japanese surrender, when it was liberated by Allied Forces in August 1945. His family were stunned when he reappeared in Blackpool. They had waited at the train station for him, and when he did not appear they were convinced that he had died. An amateur historian, Tony Rodaway, who is no relation to Charles is credited with bringing this story to the attention of the world. 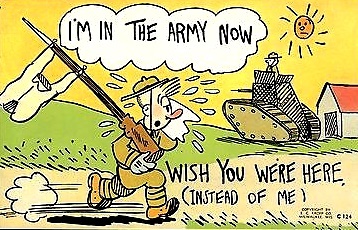 Most soldiers, on their return from war, do not talk about their experiences as it is often much too painful. In Charles’s case he must give thanks every day that the firing squad was called away. John Howard Sr. – AL; US Army, Korea, POW/ Vietnam, 1st Sgt. 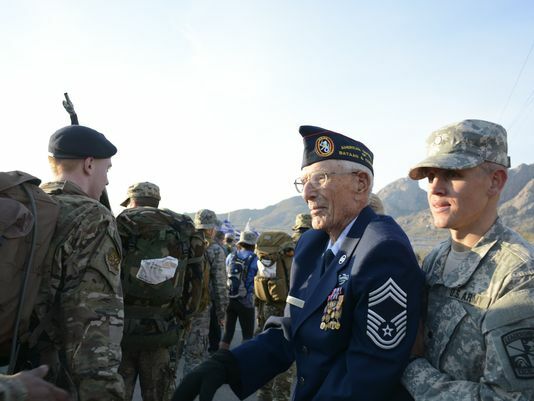 6,600 march in New Mexico to honor the Bataan fighters. 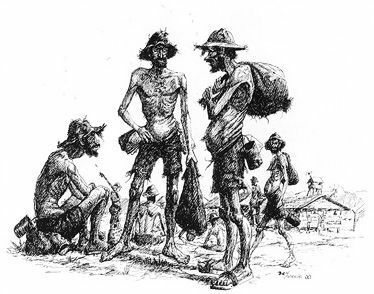 As we discuss and chronicle this war, we must not forget that the POWs of Bataan were at this point, still in captivity in various prisons of the Pacific and trying to survive. Ralph Rodriguez says he’s not a hero. He doesn’t even want to talk about his wartime experiences of battling the Japanese and surviving the Bataan Death March. 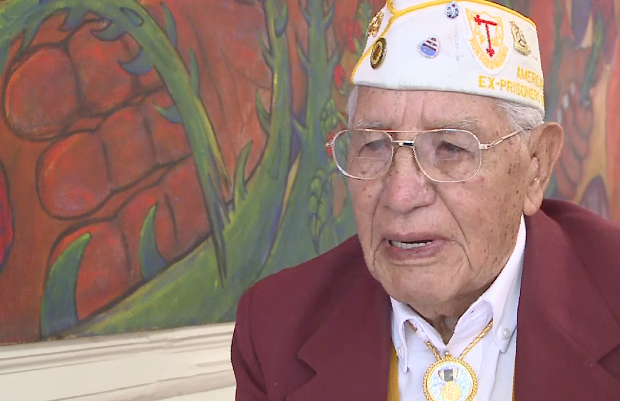 “But I do it because I need to help people remember,” said Rodriquez, 98, following Saturday’s ceremony honoring Bataan Death March survivors who are still living, as well as those who have died since April 1942, when U.S. military commanders stationed on the Bataan peninsula in the Philippines surrendered to the Japanese. “It’s not fun to really suffer or be tortured,” the Albuquerque man said. While 74 may seen an odd anniversary to mark — unlike next year’s milestone 75th — time is thinning the ranks of the Bataan survivors. Each year, their numbers dwindle a little more — nine have died since last April’s ceremony. Nine others died the year before that. Every anniversary of the march is significant. Just three showed up for Saturday’s event — Rodriguez, William Overmier, 97, and Atilano “Al” David, 95. From December 1941 to April 1942, some 1,800 New Mexico soldiers fought alongside Filipinos to repel Japanese invaders on the Bataan peninsula. On April 9, Bataan’s military commanders surrendered. 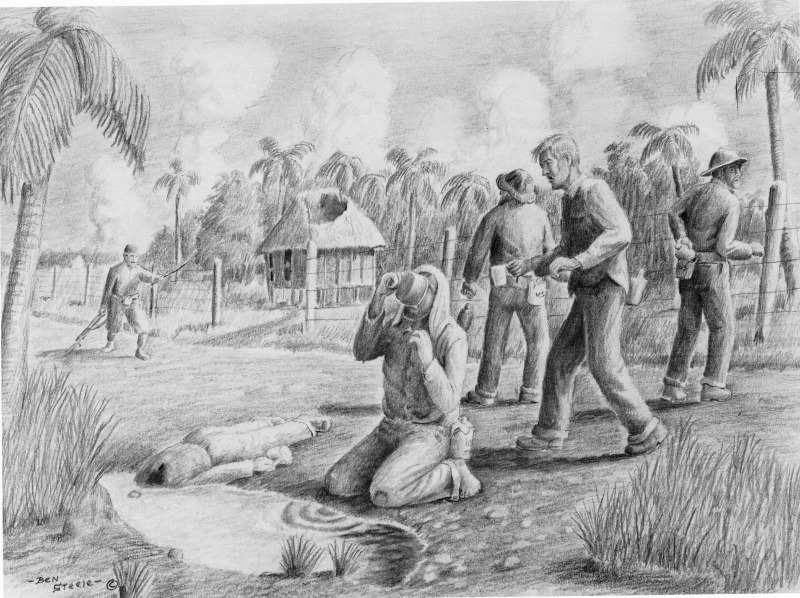 The American and Filipino defenders were either killed, captured or forced to march 65 miles through the jungle. Japanese soldiers used their bayonets and bullets along the way to kill the weak, wounded and defiant ones. Those who survived the march ended up in prisoner-of-war camps where violence, malnutrition and disease took their toll. By the war’s end, just 900 New Mexico soldiers were alive to return home. David, a native Filipino who moved to the United States in the mid-1950s, was one of the luckier ones. Weak from a combat wound and suffering from malaria, he knew he faced a risk of being bayoneted or beheaded. And had he made it to a concentration camp, he said, he would not have lasted long. But two of his military buddies who had been carrying him made a decision that saved his life: When Japanese guards were not looking, they pushed David through some deep jungle brush, and the marchers passed him by. With the aid of local Filipinos, he had recovered within a month and was battling alongside Filipino guerrilla fighters in the jungles, ambushing Japanese supply convoys. On the day the American military surrendered to the Japanese, he said, “We were crying. I was crying.” Despite being ill-equipped and surviving on one bowl of rice a week, however, many Americans and Filipinos wanted to fight on, he said. 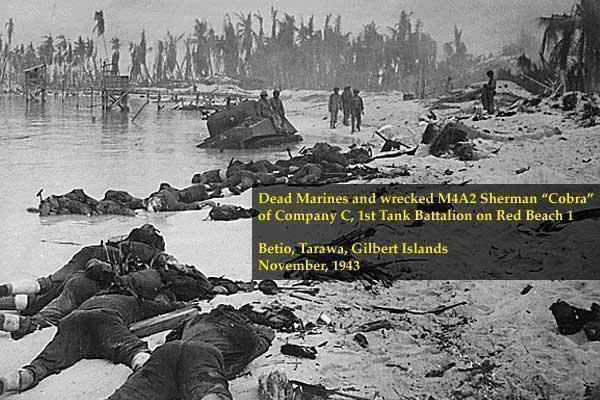 The Bataan battle, he said, was a combination of horror, chaos and death. He recounted with a tone of sorrow how he and some other soldiers had mistakenly shot down an American B-17 bomber, killing its crew, in the thick of battle. “What can you say about something like that? Sadness,” he said. Before the Americans surrendered, David felt like the defenders didn’t have a chance. “If we had had reinforcements, the proper equipment and air cover, we could have blown them all away,” he said. “We had no air cover, ineffective weapons and untrained soldiers. The Navy abandoned us. We were doomed from the start. Still, David avoided the grisly fate that many of his comrades met during or after the march. For years, he resented the Japanese, who, he said, treated the Filipino prisoners much worse than their American counterparts. One day in the mid-1950s, he found himself shaking with rage when he saw a Japanese man on the subway in New York City. David just completed a memoir of his wartime experiences called End of the Trail. He hopes it can be published before the 75th anniversary of the march next year. At 95, his mind is still sharp, though he relies on a wheelchair to get around. But there are still things he won’t talk about regarding Bataan and the war. “War is an insult to humanity,” he said. And, like Rodriguez, he says it’s not the soldiers who are the heroes. It’s their families, the ones who wait at home for them to return. Or suffer when they don’t come back at all. Drinking from the mud hole. The shooting of a straggler. Break time for the prisoners. Alan Jones – Pahiatua, NZ; RNZ Air Force # 391706, POW, Sgt. At 7:40 a.m. Jan. 25, 1944, five B-24 Liberator heavy bombers from the 308th Bombardment Group, 425th Squadron, took off from their base at Kunming, China, on a routine supply run to India. Their route took them over the Hump, a treacherous eastern stretch of tall peaks in the Himalayan mountains. At 10:45 a.m., flying at 15,000 feet, the formation “was forced to break up due to extreme instrument weather conditions,” according to World War II documents on the mission. Clouds obscured the mountains’ tree lines; visibility was less than a mile. Each aircraft was on its own, trying to land safely in valleys or at the nearest airstrip. 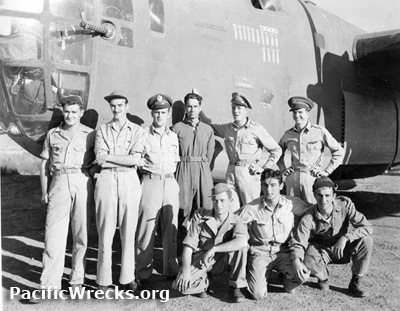 Crews parachuted out of two aircraft and survived; a third bomber crashed, with two survivors. 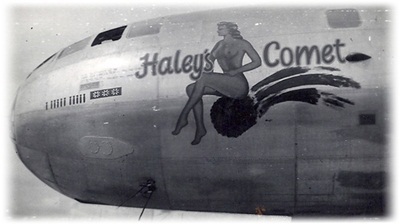 The fourth and fifth B-24s — Hot as Hell and Haley’s Comet — disappeared. Their crews were presumed dead. After many years of work, the remains of some of Hot as Hell’s crew are making their final journey home. A repatriation ceremony is planned next week in New Delhi as part of Defense Secretary Ash Carter’s trip to India. The return of the remains marks a victory in an incomplete recovery that started with luck and continues through determined persistence. Hot as Hell’s final resting place, where the wing section and engines are visible, is about 9,400 feet up the outer Himalayas in northeastern India, near China. The crash site is a three-day climb from a village called Damroh. Most of the bomber’s broken pieces are blanketed by leaf litter. The location was initially reported by Arizona mountaineer Clayton Kuhles, who had climbed the region’s mountains as a hobbyist for years until he saw his first World War II crash site. Then he combined those two passions — mountain climbing and recovery work — building a network of villagers who would report things they’d seen in the mountains and experts who helped identify wreckage and crews. To Kuhles, there were too many airmen who’d never come home. He has found the crash sites of more than 80 missing airmen, and he is driven to find more. Along the India-China route alone, DOD estimates there are remains of more than 400 airmen. In 2006 Kuhles was led to a crash site by a villager who once cut aluminum from an aircraft and carried it on his back down the mountain to salvage it. But when he grew frustrated with the difficult process, the 60-year-old hunter left the last stack he had cut at the site. He hadn’t gone back until he brought Kuhles to the wreckage. Even though there were engine parts, Kuhles could find no serial numbers – a key to identifying an aircraft. They looked all over the site. Nothing. Then the villager led him to the aluminum stack. The last sheet had the aircraft construction number 2878 stenciled on it. 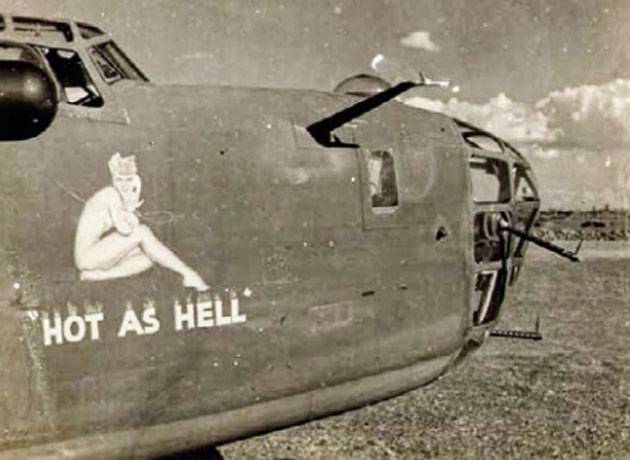 Research confirmed the link: Hot as Hell, the long-lost bomber named for its pinup girl nose art, had been found. In 2007 Gary Zaetz found Kuhles’ report about the crash on the Internet, and he knew he had to go to the site. His uncle Irwin — his father Larry’s favorite sibling — was on the Hot as Hell when it crashed. Both brothers served in the war; Irwin was a navigator, and Larry was a pharmacist’s mate 3rd class on the USS Hornet, CV-12, and at Kwajalein Atoll in the Marshall Islands. Larry Zaetz had gone a lifetime missing his younger brother, whom he nicknamed “Zipper” for his speediness on the basketball court. But Zaetz, now 91, was ill so it was up to Gary to bring Irwin home. Gary Zaetz was out of shape and had never climbed a mountain. His co-workers had a betting pool in their North Carolina office that he wouldn’t come back. 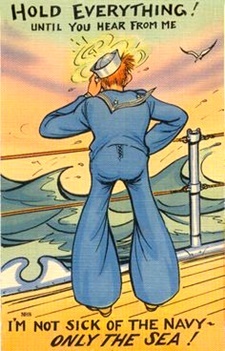 He had told the families of the Hot as Hell crew about his plans, and had gotten to know their stories. He wanted to honor the lost. At the site he took out papers and began to recite Jewish and Christian prayers, reflecting the religions of the crew. In January 2011, Kuhles reached Haley’s Comet. Its crash site is about 100 miles to the west of Hot as Hell, and the wreckage contains many more personal artifacts. There are shoes, bone fragments and clothing that Kuhles photographed and posted on his website, http://www.miarecoveries.org. The crash site has not been processed by Defense POW/MIA Accounting Agency. DPAA was notified about both sites years ago, and the same challenges that delayed Hot as Hell from being recovered for a decade haunt Haley’s Comet, such as political sensitivities within the Indian government that have hindered U.S. government teams from searching. A senior defense official who will be traveling with Carter to the repatriation ceremony said he hopes this return is the first of many. Those closest to Hot as Hell want to ensure future excavations are not handled like theirs was. When DPAA arrived at the Hot as Hell site, it did an incomplete excavation, Kuhles and Zaetz said, leading both men to believe that if a more thorough job had been done, more remains could be on their way home. Time constraints by the Indian government hampered the effort. “It’s really difficult,” said Zaetz, who is founder and chairman of Families and Supporters of America’s Arunachal Missing in Action. Family members of the Hot as Hell crew were notified by letter that the remains of one or two of the eight airmen have been collected. After the ceremony in India, the remains will be flown to DPAA’s center in Hawaii for analysis and DNA identification. 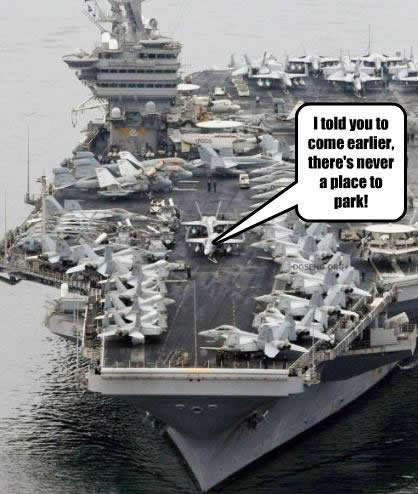 Courtesy of the Stars and Stripes. In April 1942, the Allied Forces initiated an airborne supply line that crossed the Eastern Himalaya Mountain Range. 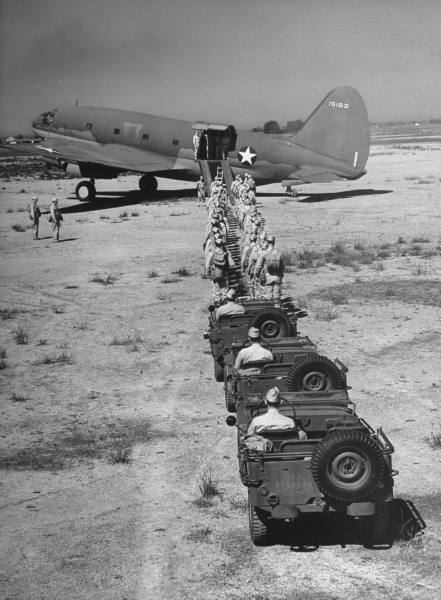 This airlift supplied the Chinese War effort against Japan from India and Burma to the Kunming area and beyond. 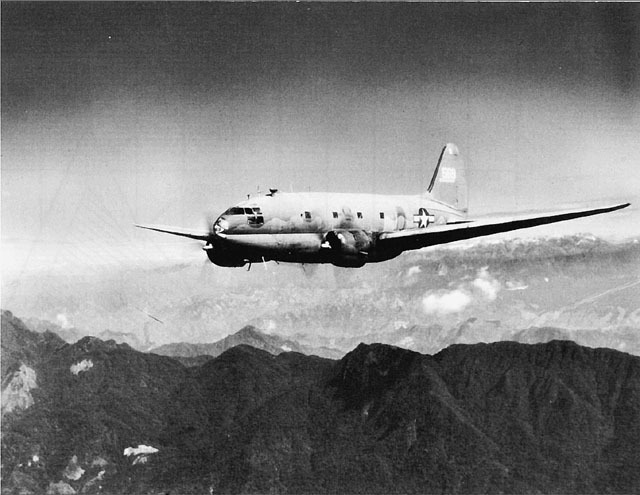 The C-46 Curtiss Commando and the DC-3/ C-47 Douglas Skytrain in the China- Burma- India Theater of War (CBI), also dubbed as the Hump operations. 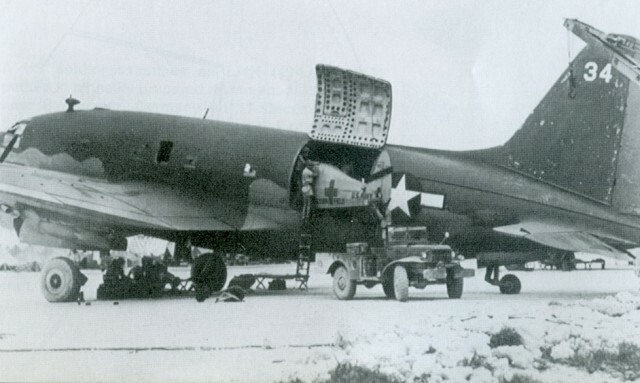 Other Cargo aircraft types that were also activated in this operation: the Douglas C-54 Skymaster, the Consolidated B-24 Liberator converted as a fuel transport C-109 and its Cargo version C-87 Liberator Express. The high incident numbers were explained by the extreme altitude and weather of the Himalaya, and another factor was the duration of the Hump operations. 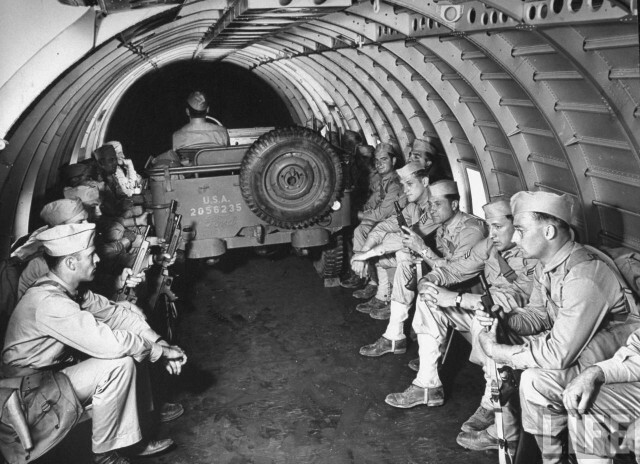 From April 1942 until August 1945, 42 months of continuous and massive flight operations, the longest airlift in days of operations that ever existed so far and in numbers of tons of cargo transported only exceeded by the post-war Berlin Airlift (1948). By July 1945, on average a whopping number of 332 aircraft a day flew over the Hump, a number five times bigger than the hard-pressed 62 aircraft on the route in January 1943. During its history, the Hump transport fleet carried 650,000 tons of gasoline, supplies, and men to China. Part of the clandestine support to China also materialized in the famous American Volunteer Group (AVG) with their “Flying Tigers” Curtiss P-40 Warhawks. 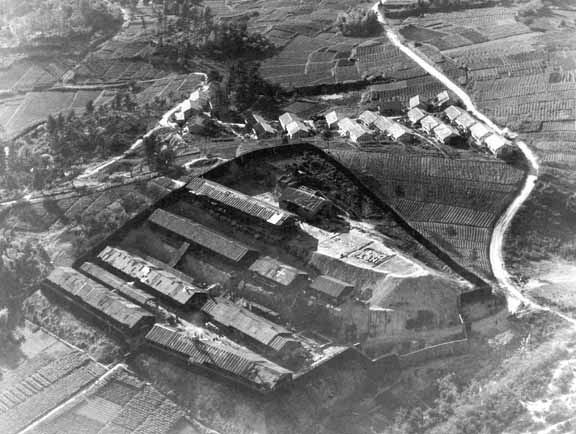 That daring initiative to fight the Japanese Imperial Army & Air Force in China with 100 pursuit aircraft and 300 American “volunteers” was masterminded by Claire L. Chennault, a retired USAAC officer. 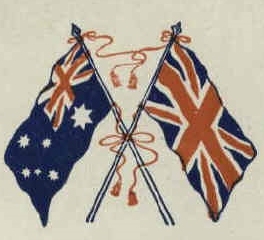 The AVG (later integrated into the USAAF) efforts needed crews, pursuit planes, fuel, food and spares. All that plus the huge supplies needed for the Chinese Army had to come over that single and most challenging Burma Road by truck! In spite of all setbacks of the extreme terrain, unpaved roads and adverse weather, it worked well. But that all changed dramatically. 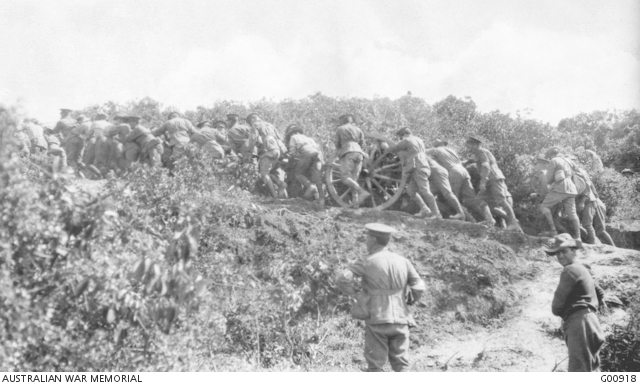 Allied access to that lifeline Burma Road was suddenly cut off. From that moment, it was decided to organize an airlift operation, running from NE India’s Assam Province town Dinjan with its airfield Chabua to the city Kunming in China’s Yunnan Province, in the region between the upper Mekong River and the Yangtze River. C-46 flying over The Hump. 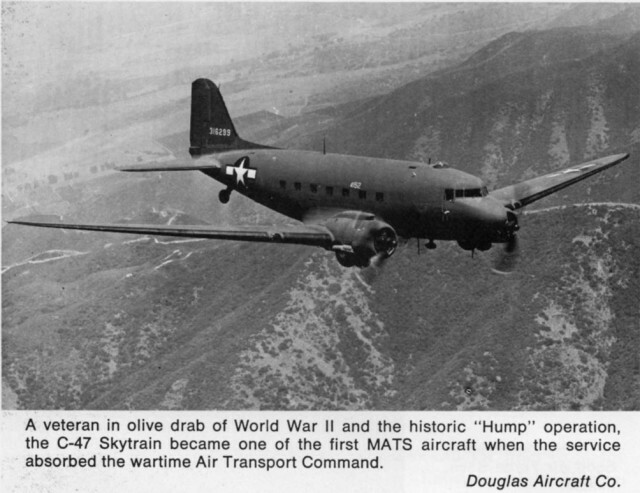 Airlift operations over the Hump started in May 1942 with only 27 aircraft, mostly Douglas C‑47 Skytrains and 10 ex PANAM DC-3’s. The C‑47’s were gradually augmented by Curtiss C‑46 Com­mandos, with their stronger R-2800 turbocharged engines & more cargo space a better match for the extreme altitude flights. Air transports flew through mountain passes that were 14,000 ft high, flanked by peaks rising to 16,500 ft. Flying time was four to six hours, depending on the weather. The airlift ultimately operated from 13 bases in India. In China, there were six bases, with the main airport at Kun­ming, which became one of the busiest airports in the world with this unprecedented airlift operation. It became a somewhat remote and forgotten war operation in this outback of the Highest Mountains in the World. Eastern India’s city Calcutta was since April 1942 the seaport, from where all goods had to be shipped in from overseas. A logistical nightmare had to be resolved to get the goods from Calcutta up north to Chabua Airport. By train turned out to be a disaster with the overload of a poorly functioning railroad infrastructure, so soon yet another air bridge was created between Calcutta and Chabua in the North. Only the “second stage” airlift brought all goods to Kunming. 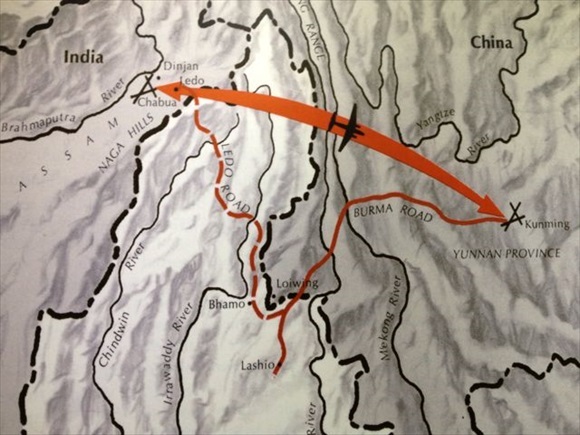 For the transport of fuel, the converted B-24 Liberator (designated C-109) was able to fly non-stop from Calcutta directly to Kunming over the ‘Low Hump route” more to the south. 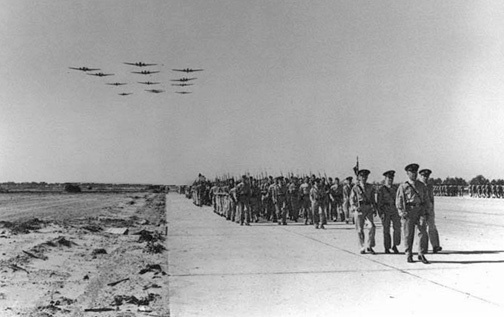 This route was frequently patrolled by the Burma-based Zero Fighters. 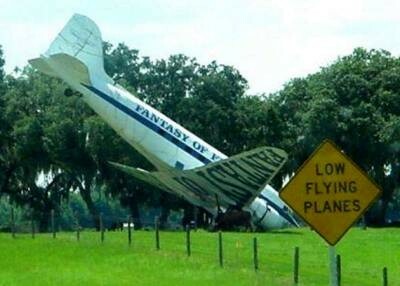 Military commanders considered flights over the Hump to be more hazardous than bombing missions over Europe! For its efforts and sacrifices, the India-China Wing of the Air Transport Command was awarded the Presidential Unit Citation on January 29, 1944; the first such award made to a non-combat organization! 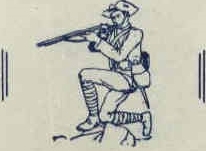 Condensed from the article in The Dakota Hunter and War History On-line. Edward ‘Leo’ Pabst – Parma, OH; USMC, WWII, Sgt. 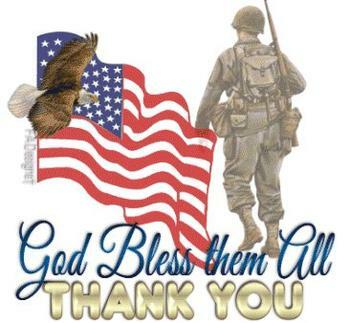 This short video, which includes WWII photos, is a prime example of that Great Generation ! During WWII, Marine 1st Lt. James E. Swett attacked 15 enemy bombers, destroying 7, on his first combat patrol. On April 7, 1943, Medal of Honor recipient and Marine fighter ace James E. Swett shot down 7 Japanese bombers, taking out four all on his own after he became separated from his wingmen. He was also on his first combat patrol. 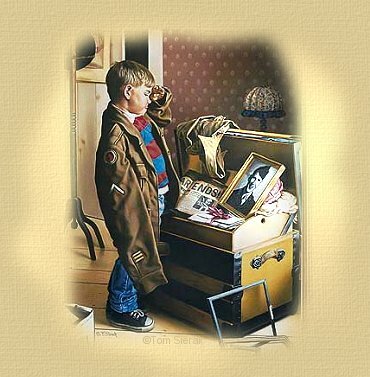 Born on June 15, 1920 in Seattle, Washington, Swett grew up in San Mateo, California and attended college there in 1939, where learned to fly. After the Dec. 7, 1941 attack on Pearl Harbor, Swett enlisted in the Naval reserves. He began flight training at Naval Air Station Corpus Christi, Texas in 1941 and graduated at the top 10% of his class, according to the Los Angeles Times. Following his graduation from flight training, Swett accepted a commission in the Marine Corps as a second lieutenant. 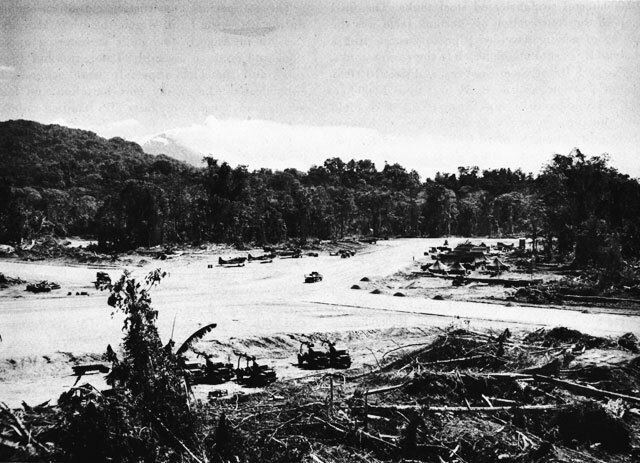 Landing under fire at Empress Augusta Bay, Bougainville, Seabees first joined with Marines in defending the beaches against counter-attack, then got busy on construction of military roads feeding front lines. The fighting builders ran one of their roads 700 yards in advance of the Marines’ front lines before the Leathernecks yelled for them to hold up a while. Sizable detachments of Seabees, who stormed ashore with Marine assault trrops in the first,second, and third waves to land on Bougainville in the Solomon Islands, distinguished themselves by the skill and valor with which they filled their combat assignments. As the invasion forces approached the enemy beaches, the Seabees manned machine guns on Higgins boats, tank lighters and landing craft. 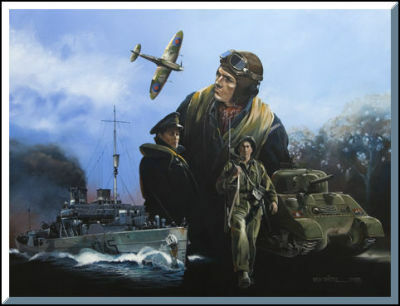 Dare-devil builders leaped ashore from the first boats to nudge into the sand, and unloaded fuel, ammunition, rations and packs while heavy fighting broke out all about them on the beaches. 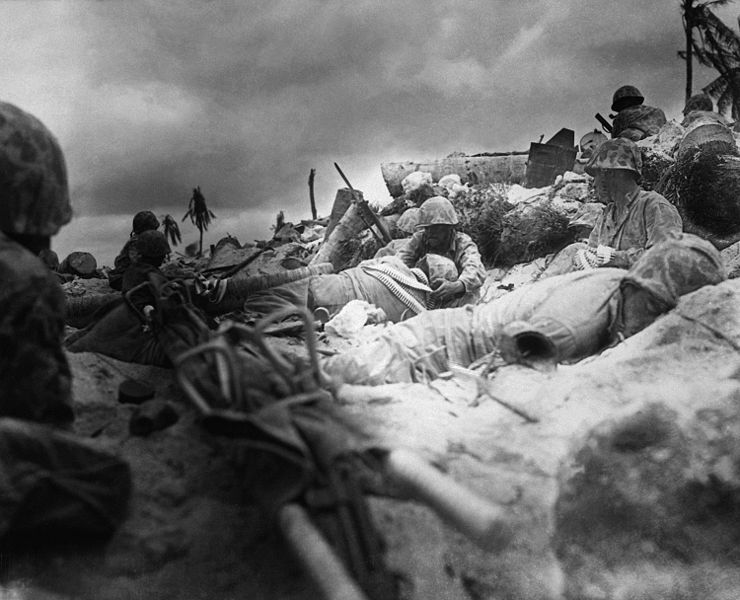 Then, as the Japs were driven back into the jungle, the Seabees manned beach defenses side-by-side with the Marines. In addition to these activities, which were beyond the normal call of duty, the volunteer group of 100 Seabee officers and men who landed with the first wave also were credited with additional acts of bravery performed with complete disregard for their personal safety. 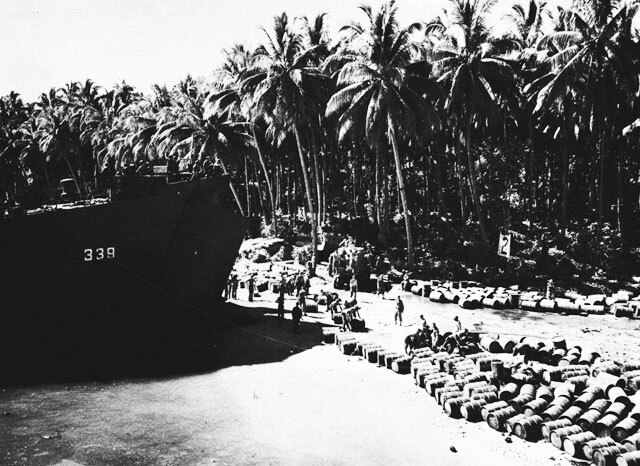 Landing craft from one transport had to pass through a narrow channel between two small islands just off Bougainville. Japanese machine gun nests on the inside of both islands had been firing upon every boat that attempted to move through the channel until Seabees manning landing craft guns effectively liquidated them. The Seabee sharp-shooters also helped drive away Japanese Zeroes that attacked the mother ship. On landing, the rugged construction men rushes supplies from landing craft to combat line. 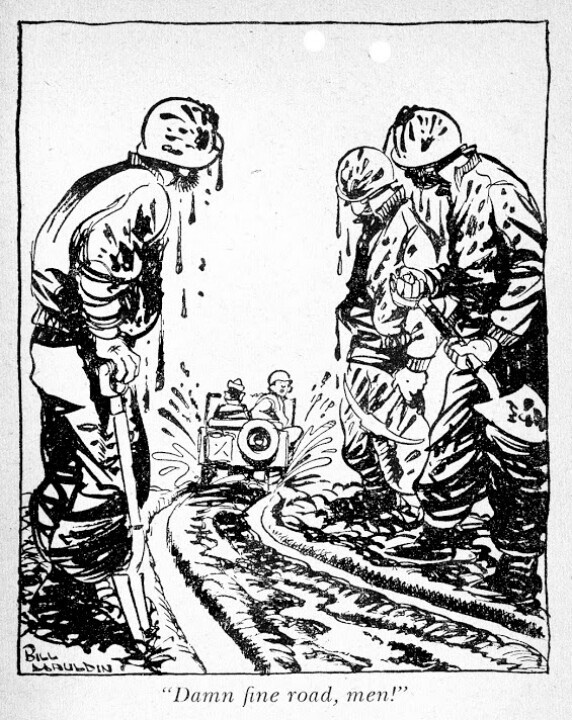 Seabees carried ammunition and water to the front and, as was learned later, kept a group of Marines from being wiped out because of lack of supplies. One Seabee jumped aboard a crippled tractor after its Marine driver had been shot off, hauled large quantities of ammunition, and helped place 20-mm anti-aircraft guns. Another group of the aroused builders riddled enemy pillboxes while Marines moved in to remove the Japs with hand grenades. 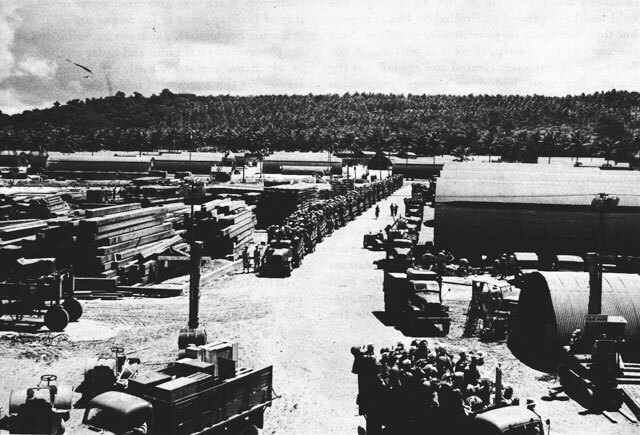 Still other Seabees moved a Marine heavy artillery battery to the front. 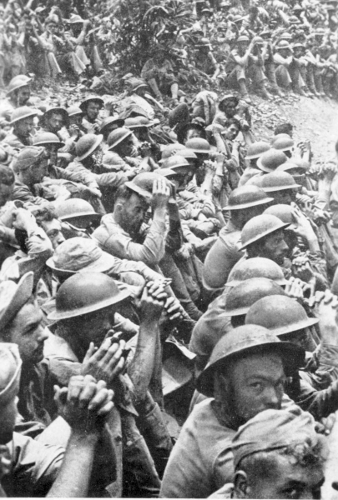 Without thought for their own safety, the Navy Construction men carried wounded from the front lines to the landing craft which would return the casualties to the transports for immediate evacuation. The Seabees scooped out foxholes, not only for themselves and the Marines, but for the injured who were unable to dig their own. When one of the landing craft was hit by heavy artillery fire, a Seabee officer helped unload the wounded and badly needed supplies while other Seabees held the Japs at bay. The medical department set up a first aid station and treated men on the front lines (which were still the beach) with morphine and bandages carried in their packs. 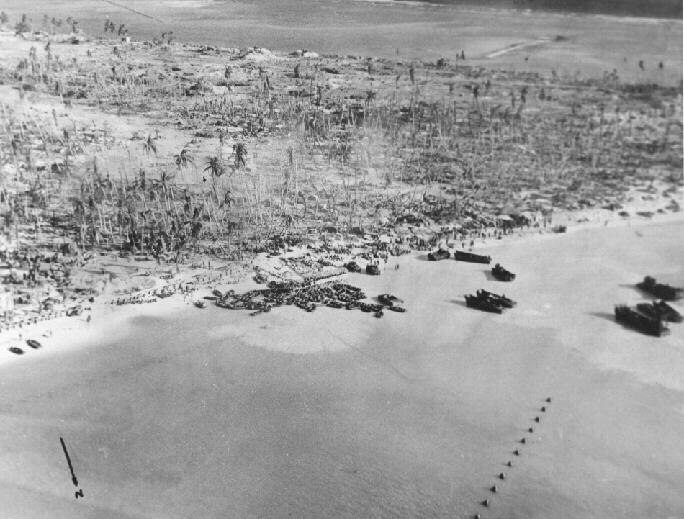 The first night of the landing, the Seabee detachment was assigned the defense of a portion of the beach. The volunteer group continued to hold this area for the next twenty-four days. For days after the landing, the battling builders teamed up with Marine patrols to locate and neutralize Japanese snipers infiltrating through the lines. From the small galley they had set up on the beach, Seabee cooks served hot meals to men on the front lines a few hundred yards away. 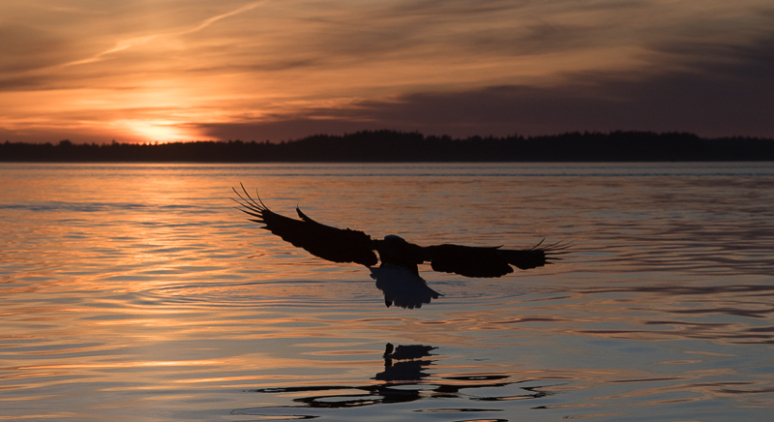 If you are interested in reading more on the SeaBees, try their museum… HERE!